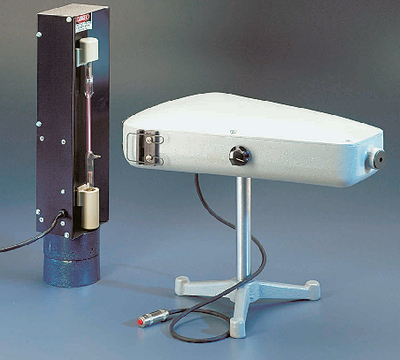 Students can use this instrument for viewing single spectra from many different sources or they can attach two spectrum tubes for comparisons of spectra between different substances. They can study absorption spectra by clipping a liquid-filled test tube to the spectrometer and shining a strong light through the tube. You can also use it as a demonstration wavelength spectrometer to illustrate Fraunhofer’s method of absolute spectrum measurement.The direct-reading spectrometer uses a transmission-type replica grating with 600 lines/mm. Light from a source enters the instrument through a 3cm high adjustable slit and passes through the grating. The spectrum produced falls on a curved, graduated scale, calibrated to read between 380nm and 750nm with a resolution of 10nm. A battery-powered lamp illuminates the scale, when you push the button on the remote wire. The apparatus is 40cm x 30cm x 10cm.